Posted on Thursday, May 26th, 2016 at 1:38 am. I am a runner. I haven’t always been a runner, but in the last few years I have enjoyed running more and more. I have found that as I get older, it’s easy to keep in shape and eat the desserts I love if I exercise. The easiest way to exercise with a busy work schedule is to literally run out the door of my house. It’s a little tougher for me in the wintertime as I’m confined to the treadmill or running in the cold and often on snow and ice. Running fits just fine into my family life as I can go early in the morning and it doesn’t interfere with my kid’s hectic schedules. I guess you can say that I’m addicted now, but there are plenty worse things to be addicted to. I love it and I have made new friends running. I enjoy spending time with these friends on our early morning runs. Without realizing it, I continued to get stronger and faster. Over the years I had run many half marathons. I finally decided to run my first marathon 3 years ago and I since have qualified for the Boston marathon. Running a marathon is a much about mental toughness as it is about physical capabilities. No matter how prepared your body is for the race, you need to keep your brain from wanting to quit when you start to hurt. The Boston marathon is the premier marathon and requires all runners to qualify to be able to participate. Some people try all their lives to get in. 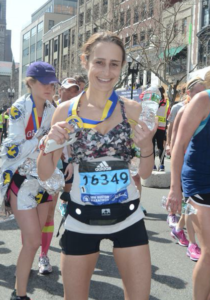 Qualifying for the Boston marathon is a source of personal pride. I have run the race in 2015 and 2016.The energy there is intoxicating. Everyone is so happy to be there and is so open to sharing their experiences. The personal stories are incredible.